*Light-A-Lamp*: The One Sentence Essay: "The Possible Impossibility"
LOVE IT. Wow God really is Wow. ALL things are possible with God..
wow! was I just thinking about the same thing all day yesterday and this morning?? How God is a God of wonders, His works are beyond comprehension, He is beyond our imagination, what we could expect! Anything that seems impossible to me is POSSIBLE with Him... Ride on! My seemingly impossible to overcome struggles are possible to overcome in Jesus name! Amen! Amen!! I really do love to watch The Ten Commandments but I did not really grasp The Almighty's Hand of Miracle until I listened to Bishop Oyedepo one sunday. 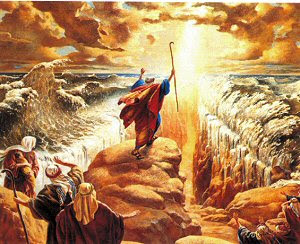 The Lord parted the Red Sea but at the same he raised the ocean floor to the coast level. I didnt really understand this until I took a physical geology class in college. I realised that the ocean has a depth of millions. Thanks for this post. its really very inspiring. @ Life of a stranger...lol. I feel the same way. You know, everyday you keep thinking maybe I won't feel the same way abt Him today...but I realize everyday that God remains the same. He has never changed and will never change. @ naijadude...isn't it always confirming when u're thinking something and all of a sudden u hear someone else saying the same exact thing? @ yayi, ur physical geology class just made this story even more thrilling and hair-raising!!! The sea has a depth in millions...but God went below and raised the depths of the ocean to the level of the sea shore (which is higher than sea-level)...ouch...how did He do that? I still think WOW@ How HE called this earth into existence out of nothing!!! Our GOD is GOOD ooooo!